Little progress can be made towards sustainable development because the country is teetering on the edge of civil war and faced with widespread famine and social catastrophe. Its problems are endemic: the population is being impoverished, political corruption is rife, agriculture and food production is feeble, the economy is overdependent on oil, water resources are scarce, and all this has been aggravated by a general state of insecurity brought on by anti-Government demonstrations and the threat of total collapse. If Yemen cannot find a balance between its citizens’ demands and its structural needs, sooner or later it is going to become a failed State. 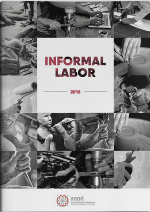 “Informal labor is not a marginal issue in Arab countries. It is a core component of modern Arab economies and the distribution of work therein and is doomed to expand under current policies,” explained Samir Aita, lead researcher of the Arab NGO Network on Development (ANND) at the launch of the 2017 edition of the Arab Watch on Economic and Social Rights, last May 8 in Beirut. It is unconscionable to require Yemen to fully implement a sophisticated regime of intellectual property protection as a condition to trade internationally, argue civil society organizations from around the world in a letter to the World Trade Organization. Yemen is one of the poorest countries in the Arab region. It has extremely weak infrastructure, and underdeveloped scientific and innovative capacities. Yemen faces massive challenges in ensuring its population has access to education, health and other basic services as the country emerges from a period of civil unrest. The accession of Yemen to the WTO will be decided in the coming ministerial meeting of the trade organization in Bali, Indonesia. Strict adherence to the protection of intellectual property should not be a precondition, argue the signatories. The Human Rights Information & Training Center (HRITC), focal point of Social Watch in Yemen, held this month a panel discussion in Aden about the implementation of the UN Security Council resolution 1325, which focuses on putting an end to discrimination against women and promoting an agenda of peace and security. In terms of gender equity the situation of Yemen is critical, second only to Afghanistan in the whole world. Yemeni women suffer are the most disenfranchised out of all women in the Middle East and North Africa. The International Federation for Human Rights (FIDH), and its partners in Yemen – the Human Rights Information and Training Center (HRITC, national focal point of Social Watch) and the National Organization for Defending Rights and Freedom (HOOD) — call on the United States government to uphold its international responsibilities and open an investigation into torture against former President Ali Abdullah Saleh, who is in the North American country now. The Human Rights Information & Training Cente (HRITC, national focal point of Social Watch) warned in a communiqué also signed by the International Federation for Human Rights (FIDH) and the Sisters' Arab Forum for Human Rights (SAF) about the risk of civil war in Yemen. This organisations also reported the death of at least 34 people in combats that took place between May 22nd and 14th. Rights Network, and UN officers. The Human Rights Information & Training Center (HRITC) condemned the continued targeting of peaceful demonstrators in Yemen and the use of the armed force against them. This organisation, focal point of Social Watch in the Arab country, reported that a young man had died and five others resulted injured by live bullets the day before in Taiz city. The clashes between security forces and participant in the protests that has been wracked Yemen since Feb. 11 took a toll of at least 120 people so far. The Human Rights Information and Training Center (HRTC), Social Watch’s focal point in that country, has claimed for an end of this situation since it began, and warned of gross abuses by the police and the military. Dozens of common citizens have been killed by Yemeni forces since the Youth Revolution broke out in February 11, according to the Human Rights Information and Training Center, national focal point of Social Watch in this arab country.